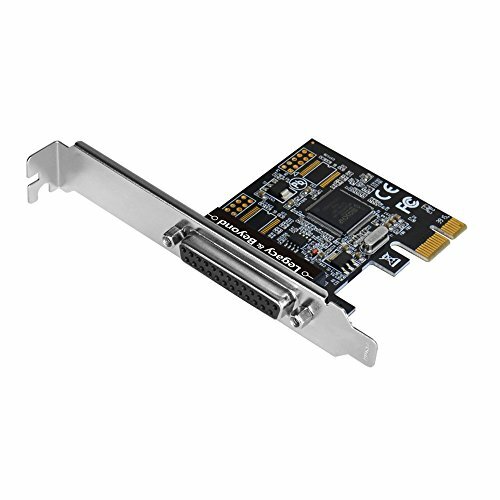 SIIG’s Single Parallel Port PCIe Card is designed to add one 25-pin parallel port to a PCI Express-equipped desktop computer. It provides data transfer rates of up to 1.5 MB/s and supports ECP, EPP, and SPP parallel port modes for optimal performance and compatibility. This is a high-performance parallel card to connect parallel port peripherals to your computer such as printers, scanners, memory card readers, and more. Quickly adds one parallel port through an available PCI Express slot ; Save the cost and hassle of upgrading peripherals to work with newer system. Supports Enhanced Capability Port (ECP), Enhanced Parallel Port (EPP) and Standard Parallel Port (SPP) for maximum compatibility with your parallel peripherals. Works hassle-free with most parallel port peripherals such as printers, scanners, memory card readers, etc.